What is an enlarged vestibular aqueduct? The vestibular aqueduct is a tiny, bony canal that extends from the inner ear’s endolymphatic space toward the brain. It is shielded by one of the densest bones in the body, the temporal bone, which also houses two sensory organs - the cochlea, which detects sound waves and turns them into nerve signals, which are then sent to the brain, and the vestibular labyrinth, which detects movement and gravity. Inside the vestibular aqueduct is the endolymphatic duct, a tube which carries endolymph to the endolymphatic sac, which is housed on the posterior surface of the temporal bone and contacts the dura mater. The function of the endolymphatic duct and sac is not totally understood, but it is believed that they help maintain the volume and ionic composition of endolymph necessary for transmitting hearing and balance nerve signals to the brain. Figure: The inner ear as seen from the back of the head, left side. Close-up view of the inner ear comparing a normal and enlarged vestibular aqueduct and endolymphatic sac. Adapted by VeDA with permission from the National Institute on Deafness and Other Communication Disorders (NIDCD). When a vestibular aqueduct is larger than normal (>1.0-1.5 mm), it is known as a large vestibular aqueduct (LVA) or by the term used here, enlarged vestibular aqueduct (EVA). EVA is the most common inner ear malformation associated with sensory hearing loss, and is detected with a CT scan. Hearing loss or balance symptoms associated with an EVA can occur when the endolymphatic duct and sac expand to fill the larger space (see Figure 1). When EVA is associated with such symptoms, it is referred to as EVA syndrome (EVA). EVA results from aberrant development later in fetal and postnatal life. It is believed that an EVA does not cause hearing loss, but rather that both are caused by the same underlying defect – i.e. mutations in a gene which causes syndromic and non-syndromic hearing loss. Hearing loss can be conductive, mixed or sensorineural, and the loss may be stable or fluctuating. Examples of syndromic EVA include Pendred syndrome or branchiootorenal syndrome. Syndromic hearing loss associated with EVA can affect other areas of the body. More commonly, the hearing loss associated with EVA is nonsyndromic, affecting only ear function. Just as the cause(s) of EVA remain unclear, much of what is known about it, e.g. why the hearing loss pattern differs among patients, how many people actually have it, how it causes symptoms, how to effectively treat it, and what the prognosis might be, remains under investigation. Genetic testing often but not always reveals that EVA is associated with mutation of the SLC26A4 gene (also called the PDS gene) which also causes Pendred syndrome, a condition associated with syndromic hearing loss and thyroid disease. Pendred syndrome occurs in an estimated one-third of people who have EVA2 and hearing loss. Hearing loss associated with Pendred syndrome is usually progressive. EVA can also be associated with branchiootorenal syndrome, which affects the anatomy of the ears, kidney, and neck. EVA is often associated with other inner ear malformations, such as a Mondini malformation, an incomplete cochlear development that is also linked to a mutation of the PDS gene. The true prevalence of EVA is likely underestimated, as with many inner ear disorders, as it is not always recognized during a medical evaluation. Estimates fall between as high as 5% to 15% in pediatric patients. Some research claims a slight female preponderance. EVA is also associated with vestibular symptoms in some people. It is hearing loss that usually brings EVA to the attention of a physician. Hearing loss can be sensorineural, conductive, or both. Sensorineural hearing loss (SNHL) is usually related to the cochlea, but sometimes to the vestibulocochlear nerve or the brain’s central auditory system. Conductive hearing loss involves a problem conducting sound waves anywhere along the route through the outer ear, tympanic membrane (ear drum) or middle ear (ossicles). Some people with EVA are born with the hearing loss. However, in most cases of EVA, the hearing loss is sudden and often progressive. It may also appear in adolescence or early adulthood. Generally, this occurs after a minor or major head impact, upper respiratory infection, or air pressure trauma such as occurs during the rapid depressurization of an airplane. The loss is often fluctuant and progressive, but generally the hearing loss occurs in a series of steps. The hearing loss onset or diagnosis is almost always in childhood. In patients with EVA, the hearing loss is usually bilateral (in both ears) but not symmetrical. Vestibular symptoms are not as common as hearing loss in persons with EVA. Symptoms range from severe episodic vertigo to unsteadiness (usually in adults) to poor coordination and imbalance in children.The symptoms of vestibular disorders are notoriously difficult for adults to describe; for children, the task is even more challenging. Unless well trained in recognizing vestibular disorders, a physician or audiologist may not ask the questions necessary to identify the patient’s vestibular problem. Physicians and researchers have traditionally devoted more attention and study to the effect of EVA on hearing than on the vestibular system. However, there is an increasing awareness of the impacts of vestibular dysfunction on persons diagnosed with EVA. Vestibular hypofunction is frequent, with other otologic symptoms variable and nonspecific, such as tinnitus and aural fullness. Recently, EVA has been associated with benign paroxysmal positional vertigo (BPPV) as well as endolymphatic hydrops. Recent research has reported that vestibular dysfunction in persons with EVA is not uncommon. An increased number of vestibular signs and symptoms are correlated with bilateral EVA. It must also be noted that not all patients with vestibular signs and symptoms have abnormal vestibular test results, and vice versa (a person with EVA may have abnormal vestibular test results but not report symptoms). Physicians and audiologists should be aware of the prevalence of vestibular disorders in patients with EVA. HOW DOES EVA CAUSE HEARING LOSS AND VESTIBULAR PROBLEMS? The sensorineural hearing loss and balance symptoms associated with EVA may occur because the enlarged endolymphatic duct and sac are unable to maintain their normal functions. 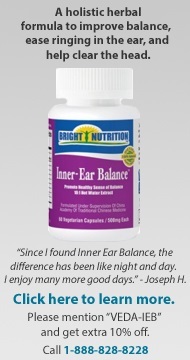 These include maintaining the endolymph volume and ionic composition (concentrations of sodium, potassium, calcium, and chloride) necessary for transmitting hearing and balance nerve signals to the brain. This disrupts inner ear homeostasis, the ionic equilibrium among the compartments of the inner ear that contain either endolymph or perilymph, fluids that have specific and different concentrations of ions. If related to head trauma, EVA may cause symptoms when the sudden fluctuation in cerebrospinal fluid (CSF) pressure forces highly concentrated proteins into the cochlear duct, which connects the CSF space to the endo-lymph space inside the cochlea. This is called hyperosmolar reflux. Conductive hearing loss with EVA may occur due to increased endolymphatic pressure. This pressure reduces the ability of the stapes to move the oval window, which is the membrane separating the middle ear from the fluid-filled inner ear. Because of this dysfunction, sound waves conducted through the middle ear can’t be transferred to the cochlea in the inner ear. Due to the variable signs of EVA, diagnosis requires special care and attention to a person’s symptoms and medical history, especially for children. In addition to a complete medical history and physical examination, the diagnostic process for uncovering EVA usually involves audiologic and vestibular testing as well as radiologic assessment. Diagnosis is usually done by positively identifying EVA on a CT scan, or confirming an enlarged endolymphatic duct and sac on high-resolution MRI. Thyroid, renal, and cardiac function may also be analyzed, and genetic screening is sometimes also performed. Historically, medical and surgical treatments have not reversed the progression of hearing or vestibular losses from an EVA. Steroid use for sudden hearing loss associated with EVA has not proven effective. Surgical shunting or removal of the endolymphatic sac is harmful and not considered a treatment option. There is no cure for EVA, but early diagnosis and prevention from (further) head trauma is necessary. People with EVA are cautioned to avoid contact sports and wear a helmet while bicycling or performing other activities that elevate risk of head injury. Amplification in the form of hearing aids can be helpful. In the case of fluctuating or progressive hearing loss, hearing aids with flexible programming options are necessary. Cochlear implants have also proven to be beneficial in some patients with EVA (this will depend on the existence of any co-morbid inner ear anomalies). In those persons with related vestibular symptoms, treatment may include vestibular rehabilitation therapy. Predicting what will ultimately happen in any one case of EVA is difficult because the condition follows no typical course. No relationship exists between how large the aqueduct is and the amount of hearing loss a person may sustain. Some cases progress to profound deafness, some include vestibular losses or difficulties, and other cases lead to neither. It’s important to remember that the signs and symptoms of EVA are quite variable. Hearing difficulties often manifest in early childhood, but there is no reliable way to predict how much hearing loss will occur or how it will (or will not) progress. Vestibular symptoms may also appear early, but are much more difficult to identify in the very young. Early diagnosis, treatment and prevention of further progression of EVA’s symptoms is essential. US National Library of Medicine. “Nonsyndromic deafness.” Available at: http://ghr.nlm.nih.gov/condition= nonsyndromicdeafness. Accessed December 14, 2009. National Institute on Deafness and Other Communication Disorders (NIDCD). “Enlarged vestibular aqueducts and childhood hearing loss.” Available at: www.nidcd.nih.gov/health/hearing/eva.asp. Accessed December 9, 2009. Madden C, Halsted M, Benton C, Greinwald J, Choo D. “Enlarged vestibular aqueduct syndrome in the pediatric population.” Otol Neurotol. 2003;24:625–632. Hamid M, Sismanis A. Clinical approach to patients with auditory and vestibular disorders. In: Hamid M, Sismanis A, eds. Medical Otology and Neurotology: A Clinical Guide to Auditory and Vestibular Dis¬orders. New York: Thieme; 2006:43–63. Turski PA, Seidenwurm DJ, David PC, et al. ACR [American College of Radiology] Appropriateness criteria: vertigo and hearing loss. Available at: www.guideline.gov/ summary/summary.aspx?doc_id=9602&nbr=005123. Accessed December 16, 2009. Dahlen RT, Harnsberger HR, Gray SD, et al. Overlapping thin-section fast spin-echo MR of the large vestibular aqueduct syndrome. Am J Neuroradiol. 1997;18:67–75. Arjmand EM, Webber A. Audiometric findings in children with a large vestibular aqueduct. Arch Otolaryngol Head Neck Surg. 2004;130:1169–1174. Miyamoto RT, Bichey BG, Wynne MK, Kirk KI. Cochlear implantation with large vestibular aqueduct syndrome. Laryngoscope. 2002;112:1178–1182. Oticon: Pediatric Clinical Support: Enlarged Vestibular Aqueduct Syndrome (EVAS) http://www.pro.oticonusa.com/~asset/cache.ashx?id=22035&type=14&format=web Retrieved from the world wide web 10/18/15. Callison, DM, Horn, KL (1998). Large Vestibular Aqueduct Syndrome: An Overlooked Etiology for Progressive Childhood Hearing Loss. J Am Acad Audiol 9 : 285-291 (1998). Arjmand EM, Webber, A. (2004). Audiometric Findings in Children with a Large Vestibular Aqueduct. Arch Otolaryngol Head Neck Surg. 130(10):1169-1174. Berrettini, S, Forli, F, Bogazzi, F, Neri, E, Salvatori, L, Casani, AP, Franceschini, SS. (2005). Large vestibular aqueduct syndrome: audiological, radiological, clinical and genetic features. American Journal of Otolaryngology–Head and Neck Medicine and Surgery 26 (2005) 363– 371.
http://www.nidcd.nih.gov/health/hearing/pages/eva.aspx. Retrieved from the world-wide web 10/22/15. Pryor, SP, Madeo, AC, Reynolds, JC, Sarlis, NJ, Arnos, KS, Nance, WE, Yang, Y, Zalewski, CK, Brewer, CC, Butman, JA, Griffith, AJ. (2005). SLC26A4/PDS genotype-phenotype correlation in hearing loss with enlargement of the vestibular aqueduct (EVA): evidence that Pendred syndrome and non-syndromic EVA are distinct clinical and genetic entities. J Med Genet 2005;42:159–165. Zalewski, CK, Chien, WW, King, KA, Muskett, JA, Baron, RE, Butman, JA, Griffith, AJ, Brewer, CC. (2015). Vestibular Dysfunction in Patients with Enlarged Vestibular Aqueduct. Otolaryngol Head Neck Surg August 2015 vol. 153 no. 2 257262. Pritchett, C., Zwolan, T., Huq, F., Phillips, A., Parmar, H., Ibrahim, M., Thorne, M. and Telian, S. (2015), Variations in the cochlear implant experience in children with enlarged vestibular aqueduct. The Laryngoscope, 125: 2169–2174. Click here to download the "Enlarged Vestibular Aqueduct (EVA)" publication.